Group SMS allows you to send an sms broadcast to either one or more groups in the address book or individual contacts in the address book. To send out messages to a group of contacts, follow the steps below. Click on “Broadcast” on the top menu . Select Groups and select one or more than one group. 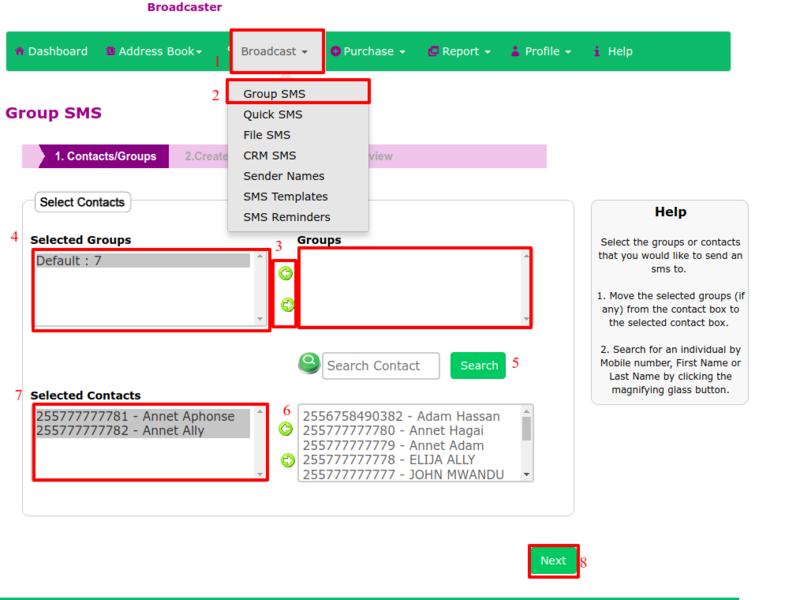 Move the selected group(s) from the contact box to the selected contact box by clicking on the provided arrow buttons in GREEN. You can also search manually for a contact by mobile number, first name or last name by clicking on the SEARCH button. After you’re done, click next. 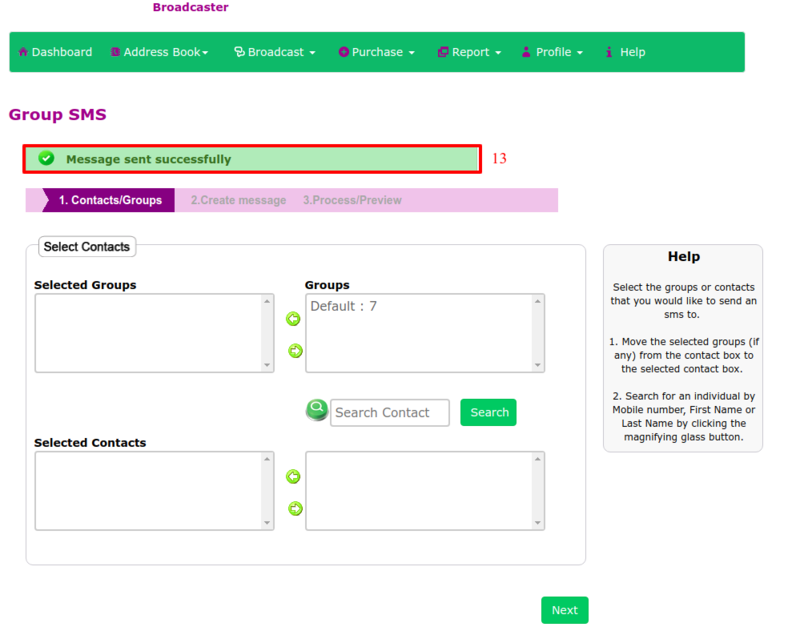 Selected contacts have been move in, you can also move any contact back to unselected contacts. then click "next" when done. Select your Sender Name. Sender Name is who the sms will appear 'From'.(Required). 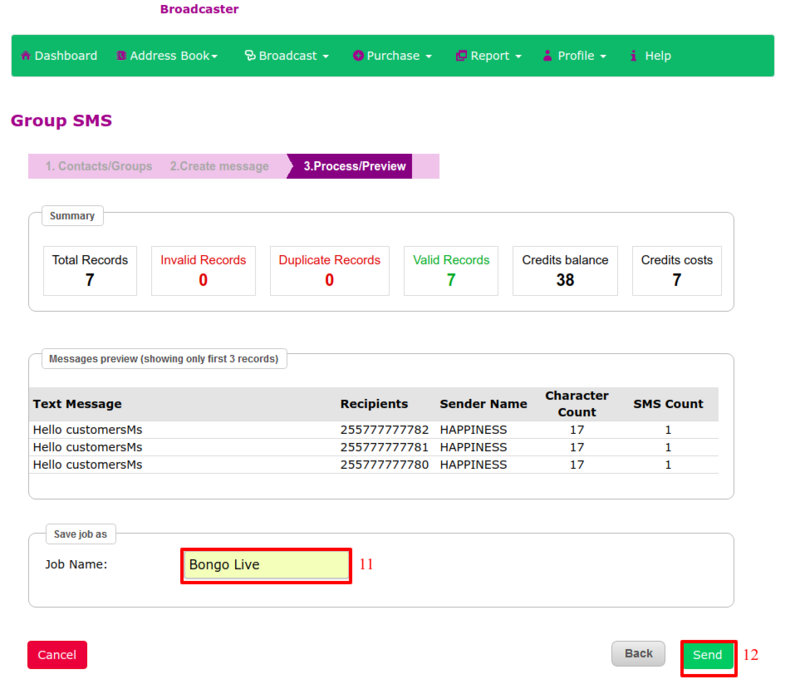 Templates are sms messages that you have saved to reuse again (optional). You can select a template if you have one. This will populate the message body with the template. Use placeholder if you want to use data stored in your address book to personalize each sms (optional). The placeholder will be replaced with details such as ‘First Name’, ‘Last name’ etc to make each sms unique. You can add more than one placeholder. You will see a preview in the last steps before sms are sent out. 10. 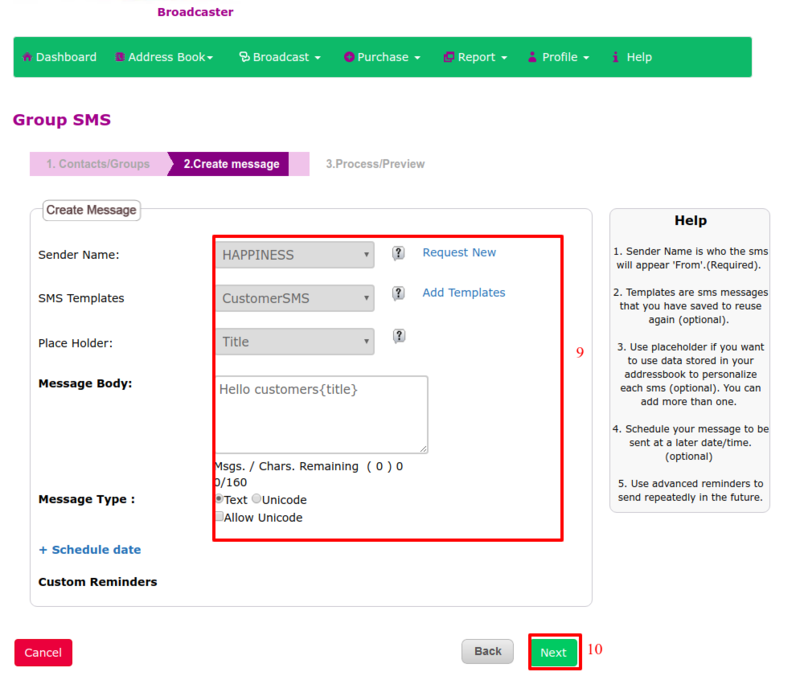 Once you’re done click “Next” After clicking “Next” button from the previous step, you will see a preview of the sms broadcast to be sent. A few sample records will be displayed including a summary of credits to be used and invalid/duplicate contacts (if any) that were excluded. 11. Enter a Job Name to remember this broadcast. 13. If satisfied, click SEND to start the broadcast.You will receive a notification “Message sent successfully” as seen below.